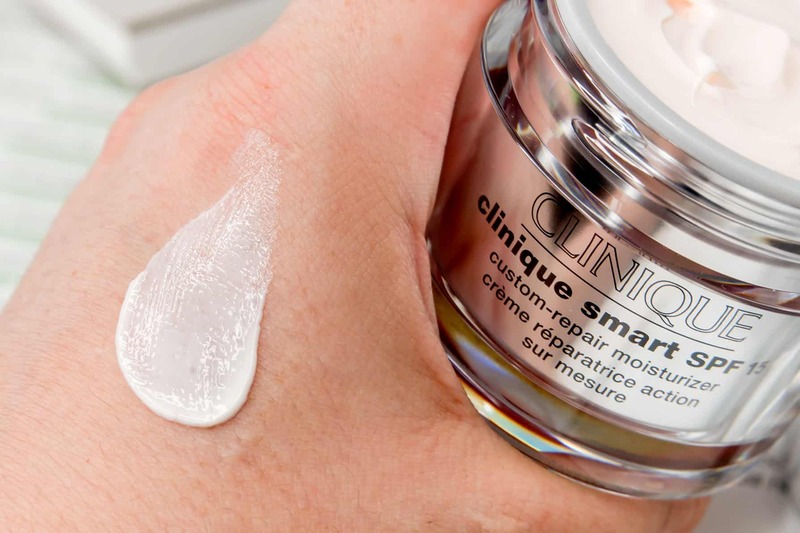 I was a little sceptical of Clinique Smart when it first launched this premium serum was first launched. I have always been a believer of prescriptive skincare used alongside a good foundation routine – using products targeted to a specific concern. 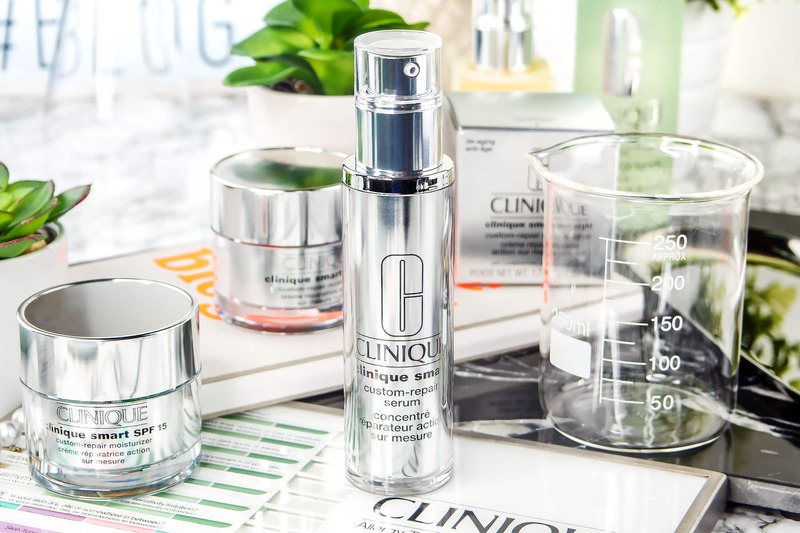 Clinique Smart Serum works, in principal, on the cell communication properties of peptides which can be programmed to target damaged/wonky cells and deliver the cocktail of reparative and restorative ingredients. So basically, if the cell has been damaged by the sun, the sun damage repair element of the cocktail will work. If it’s damaged by dehydration, then the dehydration repair element of the cocktail will work. Now, if the cell is damaged through dehydration but not by sun damage; the sun damage repair element of the cocktail will still be there floating around, it just won’t have anything to do. 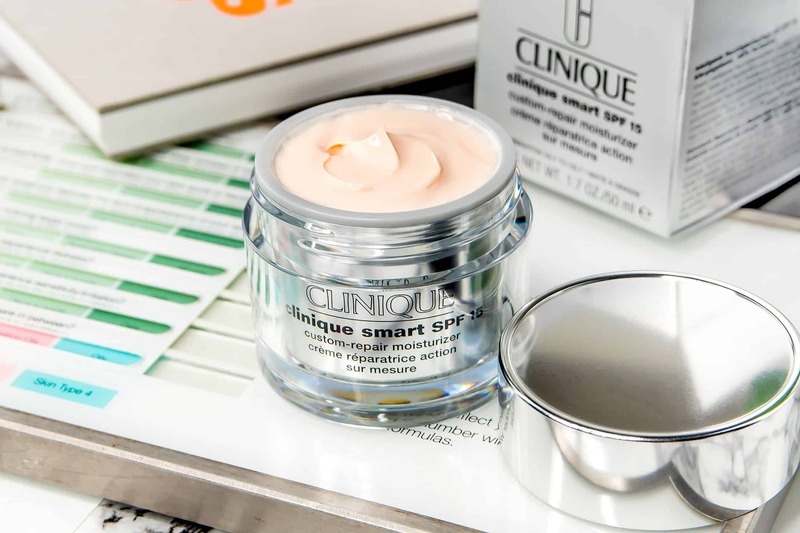 The smart serum has continued to be a favourite of my other half, Chris. He’s very confused by the world of skincare, despite having me on hand. But he’s enjoyed that universal benefits of the serum including a reduction in his enlarged pores as well as a reduction in emerging fine lines. For me it was great for pore unblocking and easing congestion as well as restoring surface hydration. 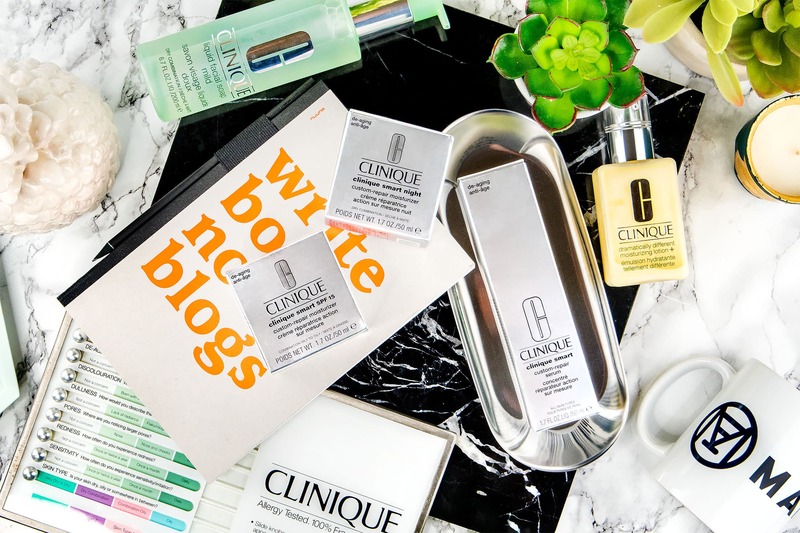 Due to the overwhelming success of Clinique’s wonderkind, at the end of last year, they launched two accompanying moisturisers – a day cream with broad spectrum SPF15 and a restorative night cream. There’s also an eye cream I’ve been testing long term and then an oil which I’ve not really given much of a look-in (I’m still sliding into using oils – Zelens are winning me over on that front lately!). 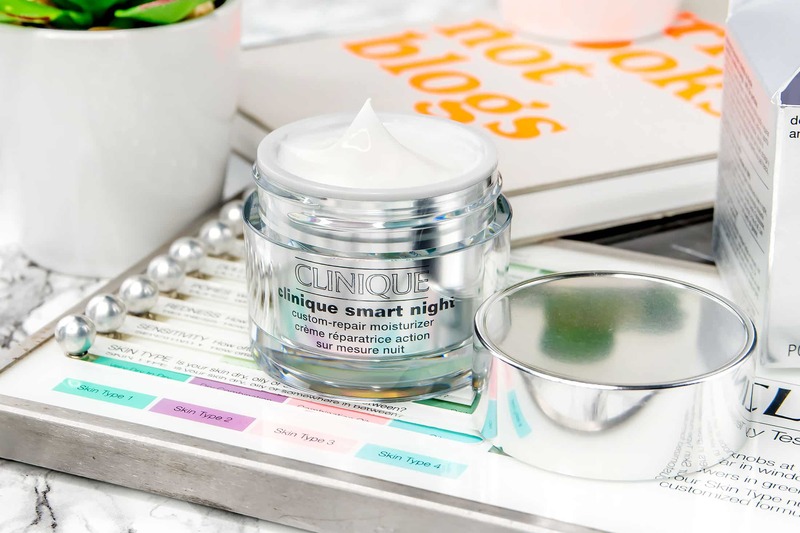 I’m reviewing the oily/combination formulation day cream and dry/combination night cream – I prefer more intense hydration at night. 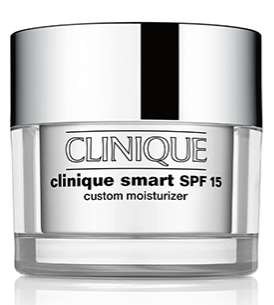 The Clinique Smart Custom SPF15 Moisturizer gives an immediate hydration boost which immediately plumps the surface of the skin and reduces the appearance of finer lines and wrinkles. The SPF15 then reduces photo-damage as any good UVA/UVB protection should. There’s also a who concoction of skin soothing and hydrating ingredients such as St. Paul’s Wort, caffeine, sugar soya and murumuru seed as well as whey extract and tamarind. Algae and Plankton extracts also help to repair skin and give it life! It feels gorgeous on the skin, and despite containing an SPF doesn’t leave a trace on the surface of the skin. It’s very cooling and it leaves my skin instantly soothed and ‘pumped’. The smell is also gorgeous with that almost medicinal scent most Clinique products have, not being masked with artificial ingredients! For me, I needed to use a serum with it to ensure my skin stayed hydrated all day. Similar ingredients to the day cream, but with a slightly richer texture added hydrating ingredient concentrations. Dimethicone also aids in delivering moisture deeper into the skin whilst you sleep. Again, very soothing, very calming. Lysate, a probiotic, is also used for skin repair along with yeast extract and soy amino acids. I found this particularly good for healing any sensitivity caused by shaving. When it’s hot at night, I’d swap this out for something with a more gel texture like The Body Shop Oils of Life, but on a normal night, this sinks into the skin and doesn’t leave me feeling like I’m wearing a ‘mask’ of cream. This article first appeared on MANFACE written by Thom Watson. It was published on Thursday 21st July 2016 and was last updated on Monday 3rd April 2017 at 12:48pm. It's categorised under Acne, spots & blemishes, Anti-Ageing, Dark Circles, Dark Spots / Pigmentation, Enlarged / Blocked Pores, Moisturise, Redness, Sensitive Skin, Serums & Treatments, Sun Protect where you'll find more related content. I use Clinique a lot but usually stick to my favourites. I love it when there is a large range – great post! Very well written! 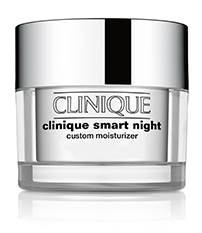 I’ve never used this Clinique line, however I typically love all their products. 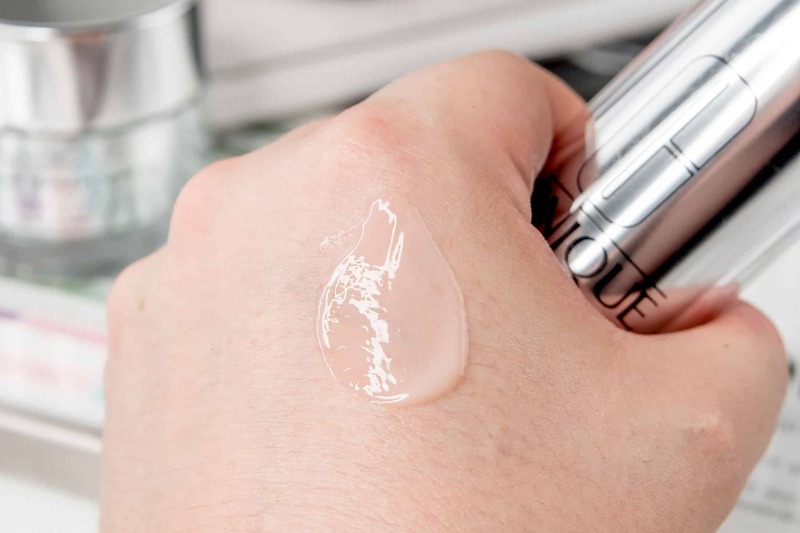 Clinique usually is the best and most effective on my oily skin, especially with the summer heat! Totally! For anything oil or blemish related, they’ve always been my go-to brand.